Set against the newly passed $700 Billion defense budget, the Summit will deliver actionable insights on contracting opportunities. 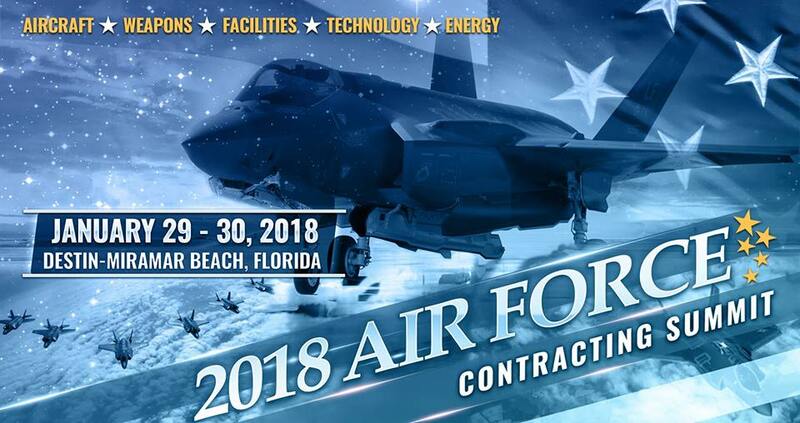 More than 400 prime contractors, subcontractors, military officials, contracting officers, and defense agencies will gather at the 2018 Air Force Contracting Summit, scheduled for January 29-30, 2018 at the Hilton Sandestin Beach Golf Resort & Spa in Northwest Florida. The Summit begins at 9:00 a.m. on January 29 with a presentation by Captain Nate Nelson on the newly passed 2018 defense budget of $700 billion. Captain Nelson is the Deputy Director of Military Affairs for Congressman Matt Gaetz (R-FL-01) who services the House Budget Committee and the House Armed Services Committee. Speakers and attendees will have the opportunity to discuss the mission and contracting priorities of the U.S. Air Force, address contracting procedures for small businesses, identify federal contracting resources, and connect prime contractors with new subcontractors. In years prior, attendees have benefited from such highly-regarded speakers as Congressman Robert Aderholt, Member, House Defense Appropriations Subcommittee; Congressman John Carter, Member, House Defense Appropriations Subcommittee; Lt. Gen. Robert McMurry, then-Commander, Air Force Research Lab; Maj. Gen. Shaun Morris, then-Commander, Air Force Armament Directorate; Maj. Gen. Scott Jansson, then-Commander, Air Force Nuclear Weapons Center; and General Norton Schwartz, 19th Chief of Staff of the Air Force. To register or learn more about the 2018 Air Force Contracting Summit, visit http://www.defenseleadershipforum.org/airforcecontractingsummit. 2018 Air Force Contracting Summit2018 Air Force Contracting Summit, scheduled for January 29 – 30, 2018 in Destin-Miramar Beach, Florida.